Thank you all for your patience during this major construction project. We are proud to say phase one of the parking lot, landscaping and lighting work is officially complete. It is exciting to get one phase crossed off our list. But, as you know, there is still work being done. As always, keep in mind these completion date are estimates. We need the weather to cooperate to finish the work in a timely fashion. In phase two, landscaping will be going in next week. And over in phase three, work is anticipated to last at least another 3 weeks. Concrete work in front of Neptune Mountaineering should wrap up by the end of this week. Demolition started today on the NE corner of Flatirons Running and will proceed south and then over to the south side of Flatiron Runningover the next few days. This area could take longer because the south side of the shop has a wider sidewalk than the others. When the concrete work is complete, crews will get started redoing the parking lot. 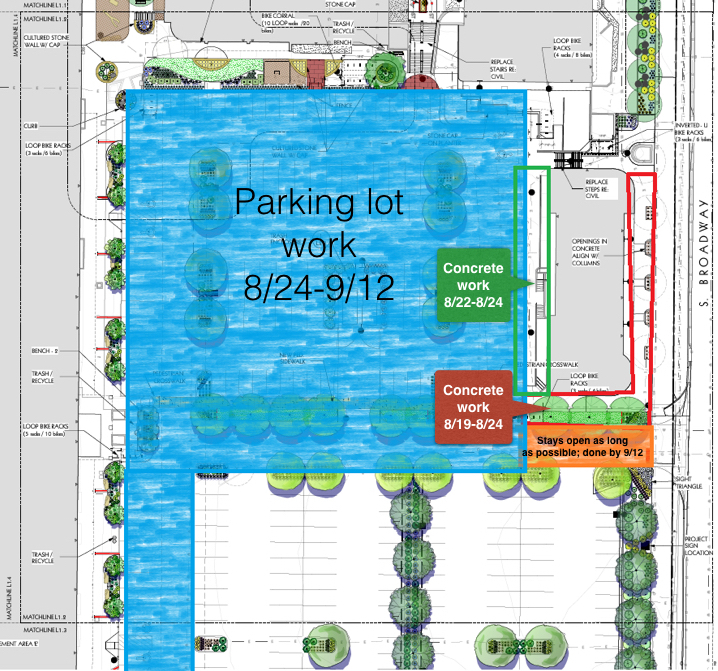 Based on the timing of the work mentioned above, we estimate the parking lot for phase four will be blocked off starting Wednesday, August 24th. We hope to have the parking lot open in phase four by September 12. As always, customers will have access to the stores even if construction work is going on nearby. This map may help explain the estimated timeline and the areas impacted in phase four. Parking has been a top concern for everyone during this project. We know it can be very inconvenient to park nowhere near the business you may be going to. It has come to our attention that there is a lot of illegal parking happening at the Table Mesa Shopping Center right now, which has caused a few accidents and concerns for safety. Customers, employees and student should know they risk being booted and towed if they don’t park in designated spots. If you are trying to get to a business by a certain time, please allow for extra time in case it takes you longer to park than you planned. Also, watch for the “additional parking” signs that are posted for assistance. August 22-25 Flatirons Running has events on those evenings. September 10 and 11 is Weaver’s Dive Shop’s annual event.